All New Honda CR-V with superior interiors and 9-Speed Automatic Transmission launched in India! New Delhi: Honda Cars India today launched its luxurious 5th Generation All New Honda CR-V in the Indian market. 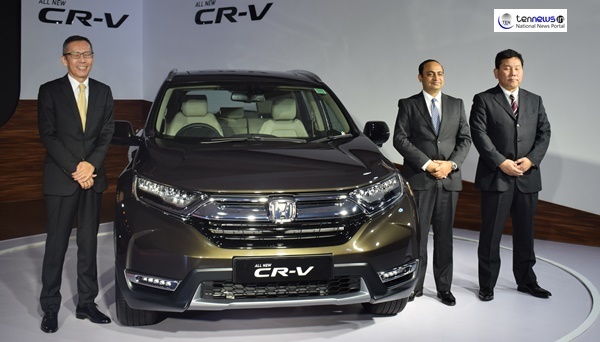 The fifth generation Honda CR-V has been launched in India at a price of Rs. 28.15 lakh, while the diesel 2WD model is priced at Rs. 30.65 lakh while the fully loaded topcspec diesel variant costs Rs. 32.75 lakh (all prices ex-showroom, Delhi). This is the first time Honda CR-V is introduced with a Diesel engine option in India and the all new model will strengthen the company’s presence in the premium SUV segment. Developed as a Benchmark for next-generation SUVs, the All New CR-V is equipped with advanced powertrains in both Diesel and Petrol offering exceptional fuel efficiency and fun-todrive performance. The all-new Honda CR-V boasts a comprehensive range of advanced and luxurious features such as Panoramic Sunroof, LED DRLs & lighting system, segment-first Full Size Driver Information Interface and advanced standard safety equipment that takes SUV standards to the next level.